Authors: de Oliveira T, Shafer WR, Seebregts C, for SATuRN. The Opinion article by S. Karim and Q. Karim laments the lack of an effective conduit between South Africa's AIDS research and its prevention and treatment policies and programmes (Nature 463, 733?734; 2010). We would like to draw attention to an HIV-1 drug-resistance database, a scientific resource for regional and global HIV research that will enhance surveillance programmes in southern Africa. The database was established by investigators from the Southern African Treatment and Resistance Network (SATuRN), in collaboration with researchers from the United States and Europe. SATuRN will provide national departments of health with highquality, up-to-date information to guide delivery of antiretroviral therapy, helping to ensure the long-term success of antiretroviral treatment programmes. As part of this network, we have installed a South African mirror of the Stanford HIV Drug Resistance Database (HIVDB). This mirror (www.bioafrica.net/saturn) will be continuously updated and released to local investigators in a curated and readily analysable form, in the context of more than 120,000 sequences already in the Stanford HIVDB. Neighbouring countries that share subtype C as the predominant virus (the strain fuelling southern Africa'sAIDS epidemic) are also providing data. The mirror will ensure that subtype-C sequences are analysed according to standard state-of-the-art technologies developed by Stanford HIVDB. It will help patient management, allowing quick identification of resistant strains and systematic tracking both of resistance patterns and of prevalence and distribution of resistance mutations within different population groups. It will inform decisions about new drugs, diagnostics and treatment strategies in southern Africa. Already, the data show that resistance in newly infected individuals is still very low (under 5%), as is the accumulation of thymidine-analogue mutations that can limit the effectiveness of second-line antiretroviral therapy. Investigators, clinicians and laboratories wishing to take part in the collaboration should contact the authors. Citation: de Oliveira T, Shafer WR, Seebregts C, for SATuRN. Public Database for HIV Drug Resistance in southern Africa Nature,464(7289):673 (2010). 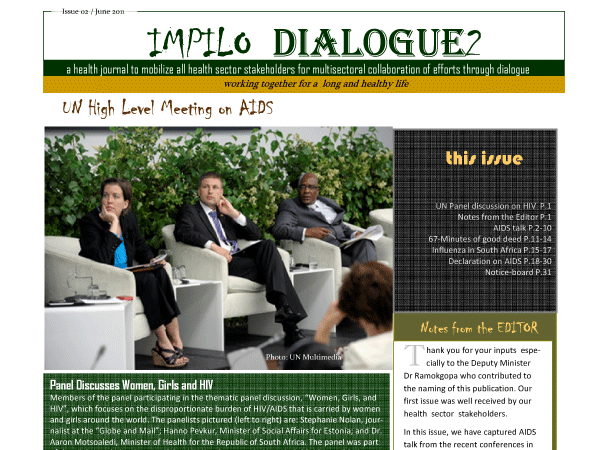 Public database for HIV drug resistance in southern AfricaImpilo Dialogues - DoH newsletter - 2011-06-25 PRETORIA - We would like to draw attention to an HIV-1 drug resistance database, a scientific resource for regional and global HIV research that will enhance surveillance programmes in southern Africa.The database was established by investigators from the Southern African Treatment and Resistance Network (SATuRN), in collaboration with researchers from the United States & Europe. SAT- uRN will provide national de- partments of health with high quality, up-to-date information to guide delivery of antiretroviral ther- apy, helping to ensure the long -term success of antiretroviral treatment programmes. DURBAN, SOUTH AFRICA, 24-26 FEB 2012 - A small, highly specialized multidisciplinary team of doctors and statisticians from South Africa, Botswana, the USA and the UK will meet in Durban this weekend with the express purpose of pooling their resources, knowledge and expertise in an attempt to improve understanding the problem of HIV drug resistance in southern Africa. Sequencing-based diagnostics for human immunodeficiency virus (HIV)-infected individuals will be carried out in Africa in order to determine resistance to antiretroviral drugs. During July, the acclaimed researcher, Dr Tulio de Oliveira from the Southern African Treatment Research Network (SATuRN), was invited to CAPRISA to visit CAPRISA's eThekwini Clinical Research Site. He also presented latest developments on affordable HIV and TB drug resistance testing and open access, public, drug resistance databases to CAPRISA's management team, followed by discussions on possible opportunities for collaboration. Drug resistance poses significant potential problems in the fight against HIV and TB, but little is known about how best to tackle it. Dr Tulio de Oliveira heads a network that aims to fill this knowledge gap. Professor Salim Abdool Karim and Health Minister, Dr Aaron Motsoaledi, awarded a R16.5 million grant to fight HIV drug resistance and transmission in rural KwaZulu-Natal.